signed on to do the original Broadway cast album. performances, no company was willing to step up to the plate after the fact. didn’t get enough people to buy tickets. Must the Show Go On?” in anticipation of those bad reviews? would be the only one. happen. There’s a terrific band and a real nice crowd of songs. over city life. That may seem an odd take from the ultra-sophisticated Coward. town became the show’s biggest hit. (That brought no pleasure to Mrs. Hale). Chicago, Illinois, any girl who meets a boy giggles and shoots him dead”? but two Oscars in the same year for BULLDOG DRUMMOND and CONDEMNED. “I never learned to bat or bowl,” sings “The Boy Actor” in the song by that name. proved once again from these recordings. instrument.” If anyone knows more, I’d love to hear from you. about musicals were sitting in the library pouring through Theatre World annuals and came across this title at the end of an exhausting day. 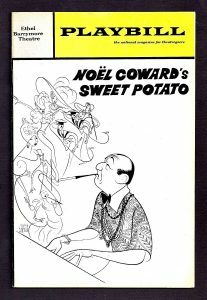 They simply abbreviated the title to N.C.’S SWEET POTATO, figuring they’d remember that “N.C.” meant Noel Coward once they got home and began transcribing.